A new injection molding machine for the processing of all common rubber compounds and other elastomer materials has been developed by ENGEL. The new ENGEL flexseal 300 T horizontal machine with a clamping force of 3,000 kN has been designed specifically for the needs of international O-ring and flat gasket manufacturers and sets new standards for the industry with its features. Particular attention was given to the machine size during development, because the machine footprint is growing in importance as an efficiency factor and has already become a decisive criterion for choosing new production equipment. Thus the new machine is significantly shorter than other injection molding machines for elastomer processing in this high clamping force class, and with its heating plates sized 550 by 650 mm still provides more room for the mold, for automation, and for accessing the machine nozzle. The hydraulic tie-bar machine is equipped with a screw injection unit that ensures very high precision for production with small and mid-sized shot volumes. The plasticizing units for rubber, solid silicone, LSR and TPE can be exchanged very easily. Each injection unit is available in two cylinder diameters with up to 2400 bar injection pressure. In addition, numerous options are available such as custom-sized heating plates or a greater distance between plates. Standardized interfaces are available for the integration of conventional brush and part removal modules as well as other automation features and peripherals. 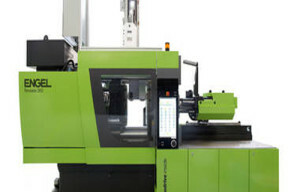 The peripheral systems can be operated comfortably via the CC300 control unit of the injection molding machine. As a standard, the ENGEL flexseal 300 T comes equipped with the servo-hydraulic ENGEL ecodrive. This helps reduce the energy consumption of the machine significantly because the heating phases in the production of O-rings and flat gaskets are often long.